Partnership between researchers and land managers has been a fundamental component of the Andrews Forest program since the designation of the experimental forest. The Research-Management partnership takes many forms, from joint management of the property to collaborative efforts to explore how current science informs and challenges management paradigms. Researchers and managers share a commitment to use current science to develop new approaches to management. The ways that land use affects forests, streams, and landscapes is an important science focus to scientists and managers. Important elements of the research-management partnership are conducting long-term experiments on landscape management and facilitating effective communication between scientists and managers. These activities occur in the institutional context of the Central Cascades Adaptive Management Partnership (CCAMP). The work extends well beyond the boundaries of the experimental forest. Workshops, field tours, meetings and synthesis products are designed for the mutual benefit of managers and scientists, as well as the general public, students, educators, and decision makers. The Andrews is part of other research management partnerships as well, including the Effectiveness Monitoring Program of Region 6 of the Forest Service. This effort monitors long-term trends in vegetation and spotted owl populations across western Oregon, Washington and northern California. Andrews Forest scientists contribute data and conduct monitoring research in support of this effort. The Andrews also collaborates with OSU Extension to engage with private landowners and participates in the McKenzie Watershed Council. Contact the Willamette National Forest Science Liaison or the Andrews Forest Director for more information. The Andrews Forest provides science on multiple themes and provides a broader foundation for regional studies. 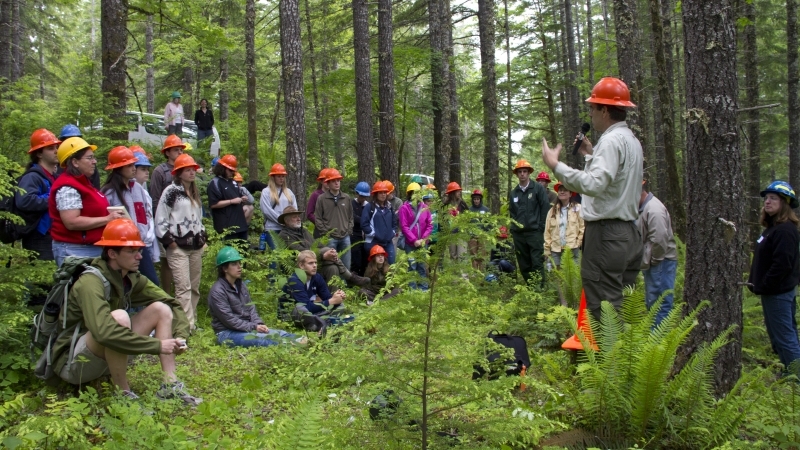 The Andrews Forest (AND) Program is part of the Long-Term Ecological Research (LTER) Network established by the National Science Foundation. Link to other LTER Network Site Profiles. Copyright © 2011–2017 HJ Andrews Experimental Forest LTER. All rights reserved.